The Event Toolbox is your planning place for a successful Fundraising Event. Here you'll find everything you need to pull off an organized, super fun and profitable Event style fundraiser. Each toolbox drawer contains an organized flow of support documents for your EVENT TEAM (Planning Committee) to follow. START with the Let's Get Started - Ready, Set Go! drawer. It has helpful information to launch your fundraiser. DON'T SKIP the Rewards and Incentives drawer, it's packed with great incentive suggestions that will help you decide how to motivate students to reach donation goals. We have a plethora of ideas that cover every level of earning potential. 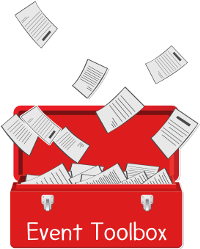 PLUS, each person on your EVENT TEAM has their own individual drawer so they can access their own support documents, "how to" guides and much more. EXTRA SUPPORT, you can always count on your friendly Personal Event Coach for further assistance and ideas on event planning, the lastest and greatest incentives ideas or any other quesions you might have. The Event Toolbox Index is a great reference of the contents in each drawer. Let's Get Started - Ready, Set Go! – Discover all the Companies that have partnered with us to give you great advantages and discounts. Rewards & Incentives are Key! Pedometers are a Great Reward! Video #2 - Get to Goal! Promo Flyer #10 Goal, We’re Almost There! Promo Flyer #11 Goal, We Did It!